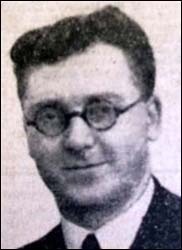 William Ernest Williams enlisted in the RAF in 1941 after leaving his job as manager of a Llandudno furniture shop, a company he had worked for since joining as an apprentice. After a period of training in the USA, he was posted to 101 Squadron, Bomber Command. In February 1943 he was the navigator aboard a Lancaster bomber that was sent on a mission to bomb a target in Milan, northern Italy. After successfully completing the bombing raid the crew were engaged by an Italian fighter plane whose burst of machine gun fire ignited the bomb bay of the British bomber, burst the petrol tank and damaged the intercom and navigation system. With the port engine on fire, the pilot put the plane into a steep dive to extinguish the flames, levelling out at 800 feet above the Italian countryside while Sergeant Williams helped to fight the on-board fire. For five hours the crew battled to haul the crippled bomber back to Britain by flying through the Alps, with William Williams navigating solely by astro readings. So as not to violate Swiss territory, he navigated around the neutral country. For his incredible skill, he was awarded the Conspicuous Gallantry Medal. Only 112 airmen were awarded this decoration in the Second World War. On returning to the RAF after leave, Sergeant Williams was assigned a new bomber. While on a test flight in March 1943, it crashed on Hornsea Beach killing all 10 occupants. 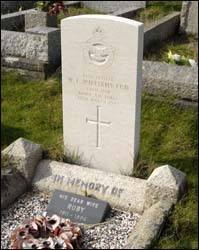 He was buried on the Great Orme with full military honours. His commanding officer described him as “a gallant gentleman”.